The year 2014 has been particularly harsh toward Egypt’s arts and culture scene. 2014 has witnessed the departure of many iconic actors, singers, directors and writers who, for many years, contributed to Egypt's cultural heritage and shaped our perceptions on arts and intellectual advancement. The loss of each artist or literary figure leaves an irreplaceable void in the country’s culture scene. These voids become even bigger once we realise how they add to an already long and distressful sequence of great names who have left us in previous years and who contributed immensely to Egypt's culture, creating foundations or planting the seed of the many riches we cherish today. Reflecting on the numerous artists’ death recently, both within older and younger generations, forces us to observe the detriment of the vacuum of talent they have left behind to Egypt’s arts and culture scene at large. As we look back at 2014, we realise how many doors have been closed forever, how we will no longer see the new cinematic endeavours of Youssef Eid, Said Saleh, Hussein El-Imam, Khalil Morsi, Abdel Mohsen Selim, Mariam Fakhr Eddine, or their much younger colleagues Khaled Saleh and Fayza Kamal. We won't read anything new from Radwa Ashour, Fathiya Assal, Mohamed Nagi or journalist Saad Hagras. We won't be able to witness the bubbling creativity of young scriptwriter Nadine Shams, nor the inspiring insights of the prominent writer and filmmaker Bassem Sabry who left us also too early. Think about those great names in terms of Moga Harra, a popular television series aired during Ramadan 2013 on which Nadine Shams worked; look into the sequel to El-Gezira which turned out to be Khaled Saleh's last role in cinema and film whose release he did not live to see; think of Youssef Eid impersonating Bob Marley in his last film El Harb El Alameya El Talta (World War III). Think about Cairo as portrayed in Blue Lorries, Radwa Ashour's last novel that she saw translated and published in English in May, hardly six months before she passed away. In the same vein, the writings by Fathiya Assal are engraved in our cultural consciousness while the picture of her standing on the stairs of the Ministry of Culture, hand in hand with artists protesting against Alaa Abdel Aziz, the minister appointed by then-president Mohamed Morsi, will remain in the minds of the many Egyptians for years to come. 2014 was a particularly cruel year as it took away double the figures from Egypt's world of culture, when compared to the three years leading up to it. Before paying our respects to all the great artists who passed away in 2014, let us recall a few of their colleagues who preceded them. Poet Ahmed Fouad Negm, ballet dancer and choreographer Abdel Moneim Kamel, filmmaker Tawfik Saleh, opera singer Ratiba El-Hefny, actress Zahret El-Ola are among a few others whose lives came to an end in 2013. 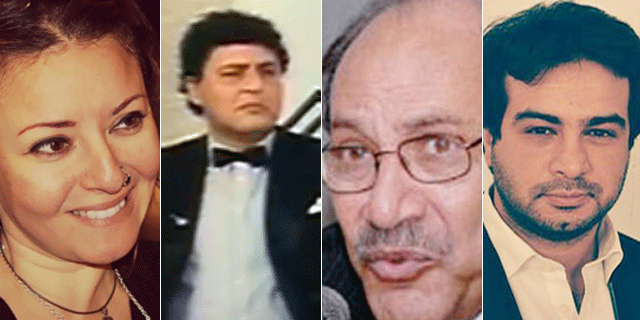 Actor Youssef Dawood, Ahmed Ramzi, theatre director Hanaa Abdel Fattah, oud player and composer Ammar El-Sherei are among the names who passed away in 2012. In 2011 we saw passing of Talaat Zein, Hind Rostom, Kamal El-Shennawy, Salah Marei, Ziad Bakir, Ahmed Bassiouny etc. The losses throughout these four years combine to yield the departure of a generation that will no longer act, direct, sculpt, paint, dance, compose or sing.